FREE. As the end of summer fast approaches, we like to try and squeeze in summer activities we figured we would have already participated in by now. 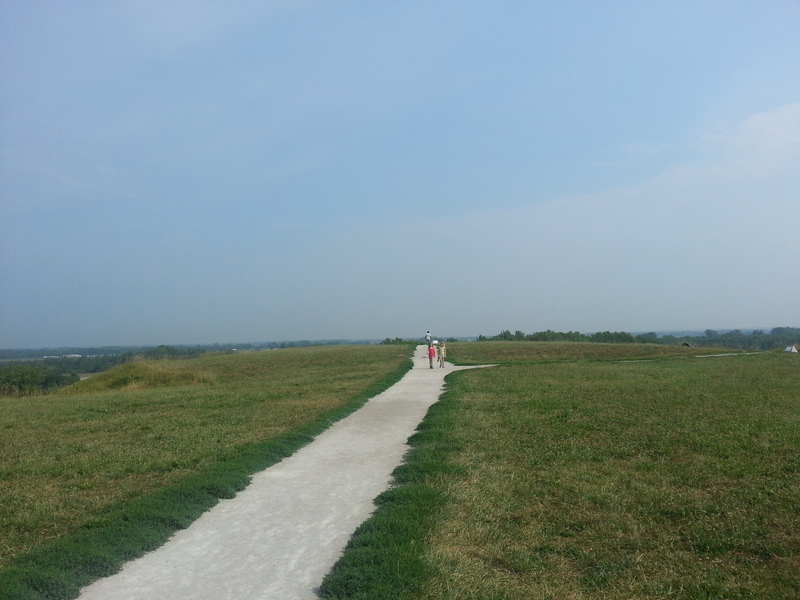 Today was our day to explore Cahokia Mounds in Collinsville, IL. We (my six and eight-year-old squirts) began with the concrete stairs which lead to the top of Monks Mound, the largest Pre-Columbian earthwork in American north of Mexico. With burning calves, I reached the top after my two boundless bundles of energy. 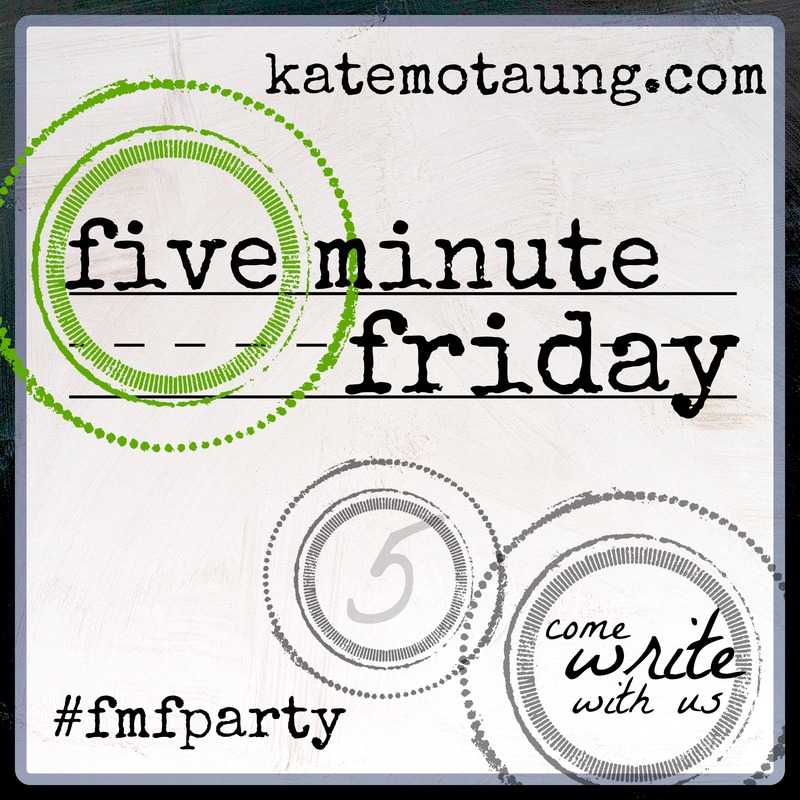 While they continued to explore the platform of the mound, I, with beads of sweat rolling down my back, rested on the bench strategically placed near the top of the stairs. Although I had visions of multiple ups and downs, we all agreed one round on the stairs was enough for today, so we headed to the Interpretive Center across the street. Since we visit this historic site at least once a year, the girls’ excitement increased as we walked closer to the heavy, ornate doors. 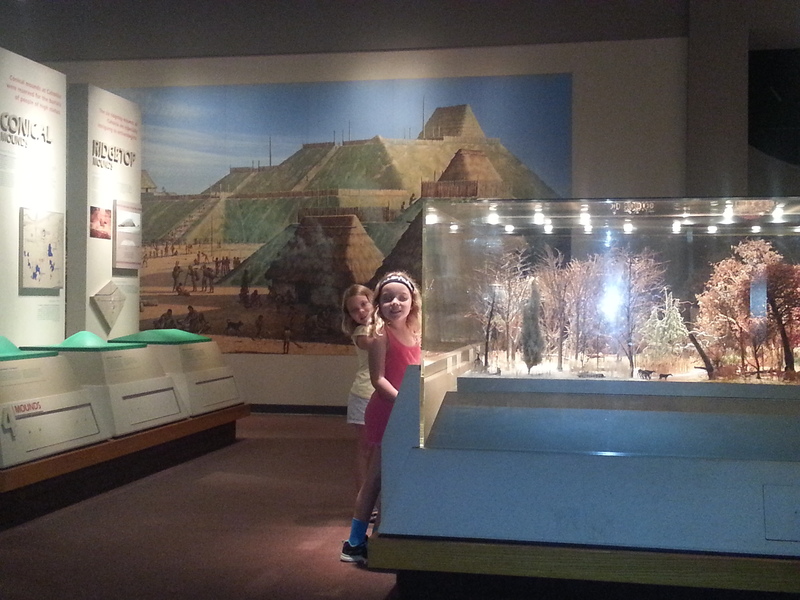 This time, though, the girls chose to investigate the exhibits before viewing the informative and award-winning fifteen-minute film, Cahokia: City of the Sun. 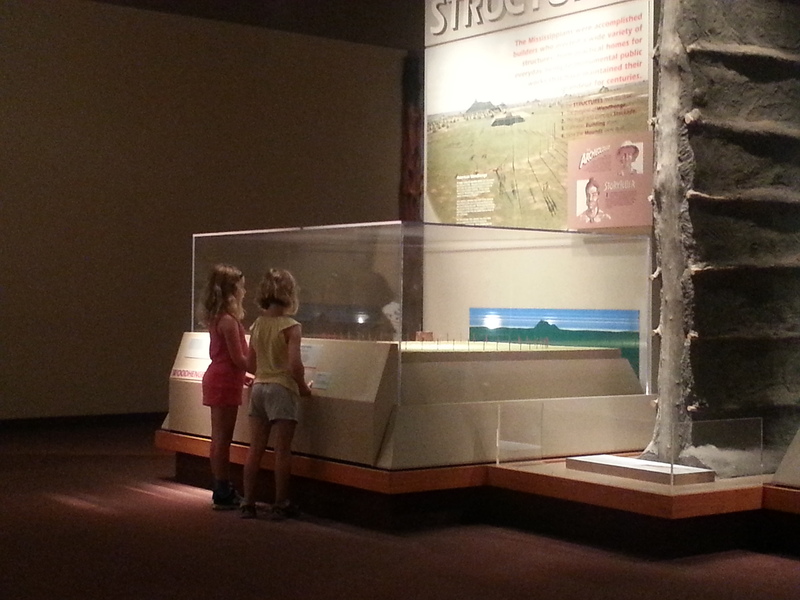 Dioramas with plenty of buttons to push in order to light certain areas entertained and educated simultaneously. 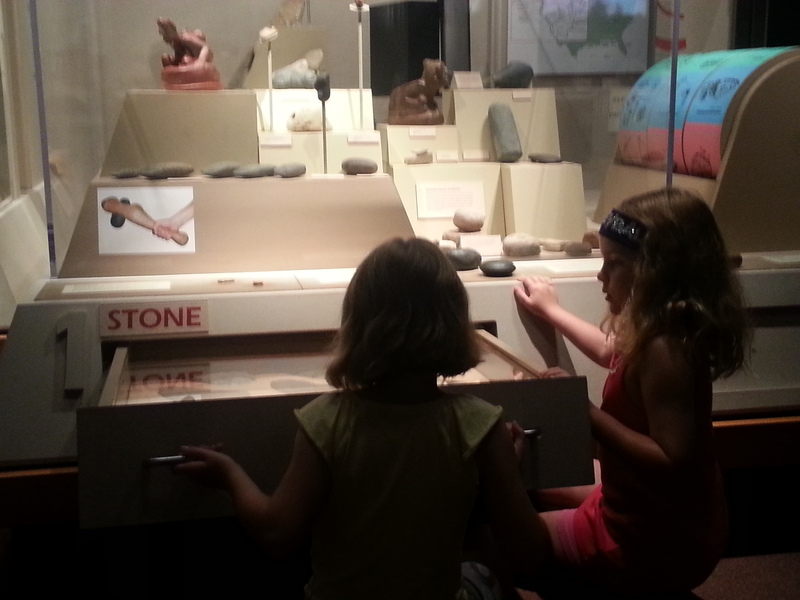 In addition, an interactive table covered with Native American toys challenged their hand-eye coordination. 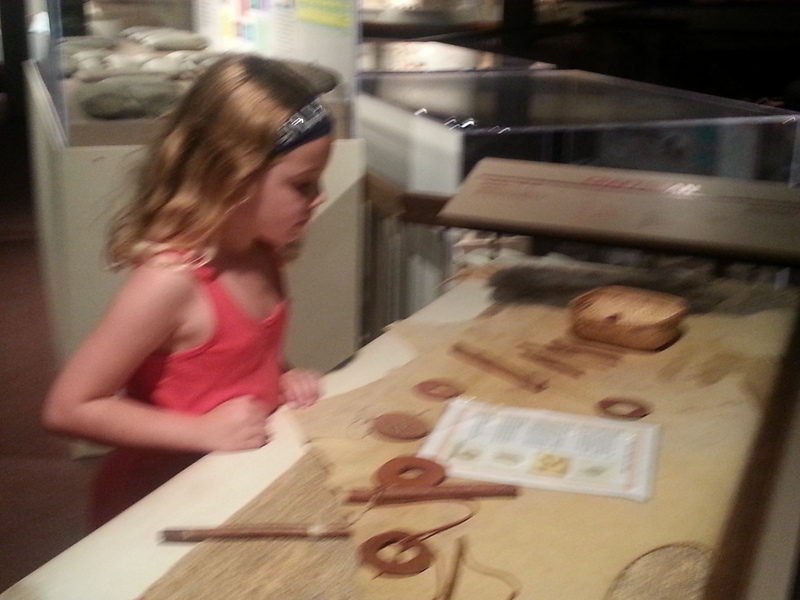 Not to forget, the drawers with pulls (a favorite of the girls) filled with artifacts allowed visitors to further expand their learning. Finally, I believe we walked through the life-size village a minimum of five times (I sat out the sixth, seventh, and eighth times) which concludes with a replica of a Sweat Lodge. A further opportunity of a self-guided tour outside amongst the other mounds was available, but we opted out since Momma’s legs had turned to jelly due to our initial climb. 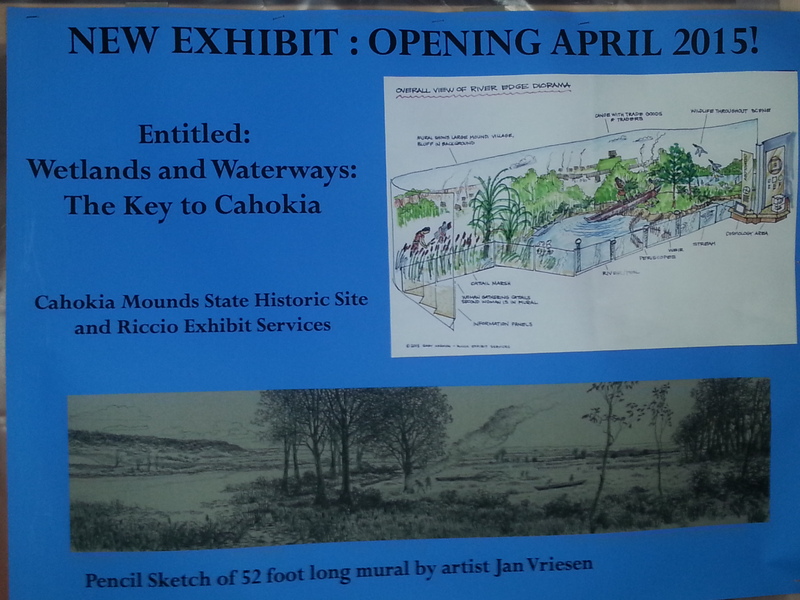 We will add this to the list for next time as well as a future exhibit coming April 2015. P.S. For the fictional book lover who enjoys the setting of Cahokia Mounds, read the Merry Gentry series by Laurell K. Hamilton. Ooh la la!